?Paioio? is our newest collaboration with long time Tiki Farm contributing artist, Philippe Tilikete. Paioio features two sets of two different, alternating Marquesan inspired Tiki Gods making up the primary exterior surface. Combined, these four Tiki Gods create for a very impressive footprint on this large 8? tall mug, lending to a substantial 20 oz. fluid capacity. 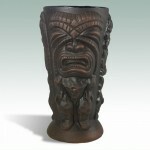 We dig Marquesan style (one of our favorites) and we hope Paioio finds a new home in your Tiki pad!